I'm not, generally, a fan of Zelda games. The NES original is impenetrable now; while at the time I'm sure its open world and undirected progression was a revelation (hell, it would be quite the achievement to get such a thing greenlit now), I've never been able to force myself to get more than a few screens into it. The big-hitter in the series, at least for my peers, was Ocarina of Time, but I've long held the unpopular opinion that it's massively overrated - although the mechanics are fairly solid, it always bugged me that the story is centred around one big plot hole1. As with most in the series I haven't played the whole game, but have played enought to experience the mechanics, and have watched more or less the whole thing through. Link's Awakening was the first in the series that I completed, but the disappointing ending kind of ruined my overall enjoyment by making the whole endeavour feel pointless. I also finished Twilight Princess on Wii, but it felt largely like a best-of, whose story was weakened by my expectations of where it would fit in the canon2. Majora's Mask is intriguing, but I've never managed to play it myself - but again, I watched my younger brother do a lot of it. The experimental level design, the three-day limit and the mask-switching were such a brilliant departure from the tried-and-tested (and, by now, predictable and kind of boring) standards of the series. Wind Waker was met with hostility from "fans" when its cel-shaded graphics were first revealed, but I remember thinking it looked like another attempt to do something new with the franchise. I was quite looking forward to it - although again, I never actually did play much of it myself until this year. I ended up seeing all the important story bits while my brother played it however, and I'm a big fan of the game's world-building and its versions of the characters - especially Ganon. The biggest thing Wind Waker has going for it, in my opinion, is the story: Link has a proper motivation for getting involved. It's not his destiny, he's not roped into it by forces bigger and more powerful than he is - he just wants to get his sister back. The things Link and the player learn at the Forsaken Fortress - and after, when you meet the King of Red Lions - change your immediate goals, but at the heart of the plot Link is still doing all of this for his family. Ocarina asks you to go save the world on the apparent whim of a sentient talking tree who's been lying to Link for his entire life. Sadly time hasn't been as kind to everything in Wind Waker as the story. While the core mechanics are fine, the lack of precise camera controls and some dodgy clipping make a few of the platforming bits trickier than they should be; it's possible that my reactions and abilities have been softened by more forgiving recent games, but a few times I have felt like the game's cheated me3. Guiding link onto ladders - especially when swimming - is awkward at best, as is trying to grab boxes or sidle along a wall. It expects a lot of precision from the player, but the Gamecube pad isn't exactly helpful in that regard. Cel-shaded and otherwise stylised graphics always hold up better than anythink that strives for realism, so Wind Waker still looks very pretty. I would like to get an RGB SCART or digital cable for the GameCube though - playing through a composite/SCART block causes some very blurry edges on our HDTV, especially noticable on the UI. The depth-of-field effect when sailing also suffers a bit, as distant objects slowly congeal rather than fading in. But the sailing itself is great. It always gives me the sense that I'm actually exploring a big world and going on a proper adventure, which was always lacking in Ocarina - there, I always felt like I was only a few minutes away from Kokiri Village where I'd started; going anywhere was never more than a mild inconvenience. 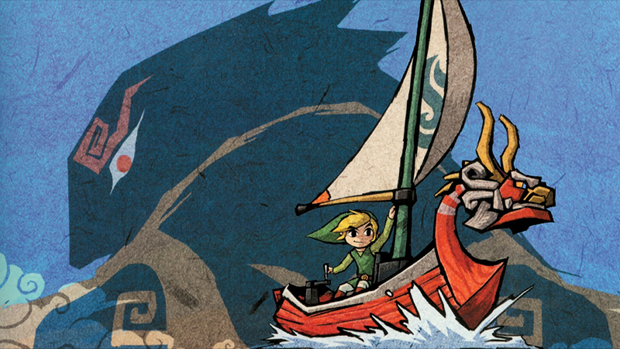 In Wind Waker, you've got to invest much more time in a journey. Some people saw that as a bad thing, but I quite enjoy the travelling. I've borrowed my little brother's copy of the game to finally try and finish it myself, although it took me a few months to get around to digging the Gamecube out of the attic to start. I'm still quite early in the story, having just picked up the Master Sword; I seem to have forgotten most of the details of the subquesting, so I'm not sure exactly how much further I have to go, but I know there are shards to hunt and sages to awaken, which is going to pad out the playtime a bit. I've got a deadline, though - the tenth anniversary of Wind Waker's European release is on the 2nd of May4, and I've got to return the disc to its rightful owner so he can play it again. I'm pretty sure I'll be done by then. 1 The only reason Ganon's able to get access to the Triforce in the original timeline is because Link opens the door for him. Not that Ganon's reign is particularly bad; apart from a change in management at the ranch, only Hyrule Castle Town seems to be affected. 2 Based on the Wind Waker opening, and some comments made in interviews by the game's director, I had hoped it would be telling the story of Hyrule's flooding post-Ocarina. 3 Nico's swabbie trials can go to hell. 4 Again: I feel super-old. "The Demon Download" and other element titles inspired by The End Of All You'll Know by 菅野 よう子 and Tim Jensen. All opinions/views are my own, except when they're not. Anything written or created by me is released under a Creative Commons cc-by-nc-sa 3.0 licence.